It’s a neat comparison to suggest that Cinerama was the IMAX of its day. The latter, those colossal cinema experiences, are quite special in their own way, but with home cinema easily available and many big new releases available on IMAX, it can’t replicate the extent to to which Cinerama really was a big deal. From 1949 to 1952, cinema audiences dwindled dangerously with the advent of television. As more American homes welcomed an ‘idiot’s lantern’, the number of people up for a night at the movies dropped by nearly a half, and Hollywood moguls scratched their heads over what to do about this crisis. The answer, inevitably, was spectacle. TVs invariably were 9″ screens, capable of producing black and white images, so the solution was to serve up something in theatres that the goggle box just couldn’t show you – sprawling films, featuring casts of thousands, made on a massive scale and in full, glorious colour. Little surprise, perhaps, that this was the era of the swords and sandals epic, the likes of Quo Vadis wowing the masses with expensively made feasts for the eyes. But it didn’t stop there. Ever earnest to undermine television, Hollywood came up with filming processes that widened the screen, given grandiose names like Vistavision and Cinemascope and offering more and more detail to awestruck audiences. ‘Widescreen’ was nothing new; as early as 1927, Abel Gance took advantage of a three-panel process called Polyvision to increase the scope of Napoleon and showed all those extras having at each other in contemporary military uniforms. But even by these standards, Cinerama offered something unique. Fred Waller, who previously had attempted a logistically ludicrous process that used eleven projectors casting their images onto a dome, developed a system in which three cameras recorded simultaneously. The results would then be projected separately onto the left, central and right panels of a huge curved screen, done in such a way to produce a single, seamless image. A seven-channel sound system was an accompanying innovation, all designed to give audiences the feeling of being virtually immersed in what was being shown on the screen. Early exhibitions of the process, the wildly successful This is Cinerama (1952) was a showcase of what it could do, opening with a Roller Coaster ride that was shown from the perspective of someone sitting in the front car. The experience for viewers must have been amazing; This is Cinerama was a huge hit, more so for the limited number of screens that could support it. Travelogues that took cameras to parts of the world previously inaccessible to the public made up much of Cinerama’s output through the rest of the 1950s, until it was decided to make dramatic films specifically for the process. The first was The Wonderful World of the Brothers Grimm. The second, and perhaps the ultimate expression of what Cinerama could create, was How the West was Won. It cost $15 million, a vast investment for the time, employed a cast of thousands to rub shoulders with some very big stars, took in the work of three prestigious directors, and created a sprawling saga that ran for more than two and a half hours. 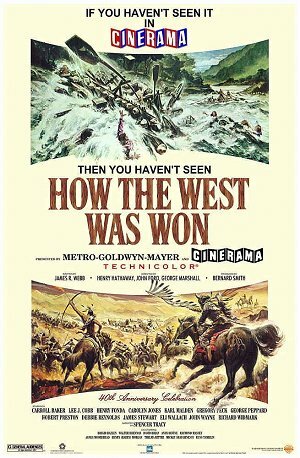 It’s difficult watching How the West was Won on a small screen to appreciate the impact it must have made on Cinemara audiences. The film was designed for those looming curved screens, so something is inevitably lost on an ordinary television, even on a modern LED. For certain, there are better Westerns. The tight plotting of the very finest the genre has to offer goes out of the window in favour of a smash and grab from classic Western stories – castle rustling, showdowns with Native Americans, train heists, gunfights. It’s all in here, stringing together a loosely arching plot that tracks the Prescott family over half a century as they emigrate westward. The story takes in their experience as pioneering emigrants, the impact of the Civil war on their fortunes, along with that of the railroad, and the brief period of lawlessness before civilisation catches up with the mass migration of humans across the continent. The conversion of a film intended for Cinerama onto a flat widescreen format presents further problems. At times, it’s possible to see the ‘joins’ on the screen, particularly when the shot is filled with blue skies. Added to that is the strange sense of perspective; it’s a little like watching the film on a cylinder, objects moving horizontally towards the screen from the right background before appearing to veer off towards the left rather than simply straight across it. To compensate for perspective issues, directors made actors stand in the dead centre of the screen and could never favour close-up shots. When two people converse, they were unable to look at each other in order for the illusion to work on Cinerama, yet on a ‘normal’ screen the problem returns and characters talk whilst peering off into some middle distance. These, however, are minor issues and never really ruin the film, rather it’s possible to sit back and luxuriate in some quite gorgeous photography. One of the enormous benefits of Cinerama was its ability to show off the American landscape in beautiful, crystal clear images, and How the West was Won features the west at its most brilliant, natural and barren, indeed much of the intention was to illustrate a land untouched by the footsteps of modern man. It’s a thing of staggering visual pleasure. The show is helped by the presence of an excellent cast of actors, a compendium of some the Western genre’s leading lights. Some, like John Wayne and Harry Morgan as jaded Generals Sherman and Grant, are little more than high profile cameo appearances. Gregory Peck is fine as a card playing rogue who also possesses a heart. There’s James Stewart, too old to be the fur tracker who captures Carroll Baker’s heart, but bringing class to the screen, and he’s involved in one of the film’s best action scenes when he helps the Prescotts beat off river pirates led by Water Brennan (and including in their ranks Lee Van Cleef). The film’s second half focuses strongly on George Peppard’s Zeb, the son of Baker and Stewart, who fights in the Civil War before helping the security of the railroad’s building and coming across Henry Fonda as a cynical and grizzled frontiersman. Zeb also has moral struggles with that classic Western anti-hero, Richard Widmark, who oversees the railtrack’s construction at any cost and whoever it affects, and later fights physically against Eli Wallach’s train robber, Charlie Gant. There’s a lot going on, so much that the film was split into five segments, three of which were directed by Henry Hathaway, with George Marshall taking on the railroad story and John Ford covering the Civil War. All three experienced frustration with the Cinerama filming, the needs of the camera taking precedence over their normal shooting style, and they all wound up using objects like tree trunks to cover up the bits where audiences might see the ‘joins’. How the West was Won is far from the best Western, but equally there’s nothing quite like it. Apart from the Cinerama aspects, it’s possible to see the film as marking the end of an era, a sort of compendium of the genre’s best bits from its classic era, before it moved into darker and grittier territory with the advent of the ‘Spaghetti’ films and Clint Eastwood. And with that, readers, we’ve reached the end of the holiday fortnight. It’s been a blast writing these pieces, and I hope you have enjoyed reading them, perhaps one or two have even inspired you to watch a film you might otherwise have ignored. The bad news is that I can’t sustain this pace over a normal working week, however I have had too much of a good time to simply stop, and will be keeping FOTB going, probably on a reduced, two-three reviews per week basis. It’s your readership and support that has kept it going, so thanks for all the Follows, Likes and Comments, and I hope to see you throughout 2015! 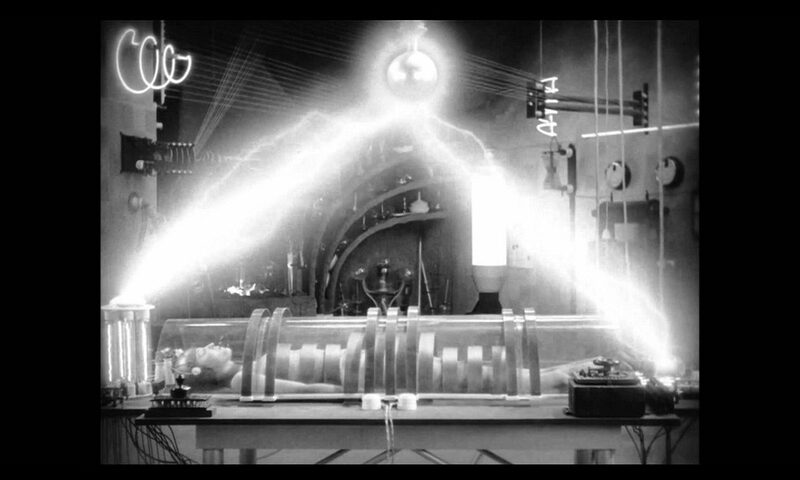 Yes, this is a film where you watch largely to admire the technical know-how on display. There are some nice little vignettes in there but the visuals are the thing really. I’ve yet to see the smile-box presentation which should give a stronger sense of what it would have looked like on the curved screen – I’ve heard my father, who experienced Cinerama theatrically, rave about the process. I really enjoyed your daily updates, Mike. It’s been very enjoyable to pop in for chats and I do hope you’re able to post on a semi-regular basis at least. I don’t live so very far from Bradford, which has screened How the West was Won in its intended form beforehand, and I owe it to myself to catch it that way some day. Whilst a gimmick of sorts, what impressed me about the film was the love that went into it, the effort to make a great Western with no expense spared, a brilliant cast and the effort that went into certain stunts (like the rolling carriage) just to immerse the audience in the action. Definitely. There’s no sense of guys just doing it for the money as you sometimes get with blockbuster type affairs. It’s extraordinarily well-crafted. Some moments in it have real poignancy, such as Henry Fonda staring at the railroad with regret for what its coming will do to the land. I can’t help feeling it’s a double-edged lament for the film’s status as a climactic Western made in the classic tradition. They weren’t the same after this era. True, there is a certain sadness at some points, and I think you’re right to view it as one of the last of a rapidly changing breed. Westerns made around this time are fascinating to watch now from a historical perspective – you can see the changes in approach creeping in bit by bit.